Cream the butter and sugar together. Add the eggs and beat thoroughly. Then add milk. alternately, with the flour and soda. Grind the raisins and orange rind in a food chopper, and add last. Bake in a greased loaf pan in a moderate oven, 350 degrees, for about 40 minutes. While the cake is baking, combine the orange juice and sugar. Let it stand in a bowl and stir occasionally. While the cake is still warm but not hot, pour this mixture very slowly over it. Some of it will soak in. The rest will form a glazed icing over the cake. 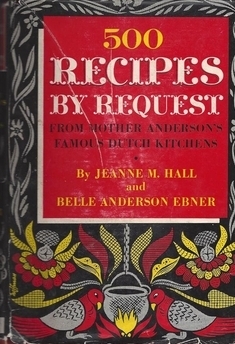 More "Lost" Recipes from "Mother Anderson's Famous Dutch Kitchens"